Luke Cage is released from solitary confinement after being locked in the ‘box’ for three days more than normal. Once in the yard Shades and Comanche try to recruit him into their gang but he’s not interested. The warden calls him into his office in hopes Luke will turn ‘informer’ but he wants none of it. In rage the warden has his men throw Luke back into confinement and give him a beating to boot. Luke refuses to fight back since that would land him in even more trouble. The new warden arrives and breaks things up, seeing the abuse Luke has undergone he locks the man inside confinement with him for ten minutes so Luke can give him a proper ‘goodbye’. The old warden is demoted and he blames everything on Luke. A new Doctor then starts monitoring Luke who tells him his origins and friendship with Willis Stryker. He was a good fighter and Willis great with knives and how they worked in gangs and became leaders. Over time he took the straight and narrow and Willis went up in the crime game. They then competed for the affections of Reva a beautiful Black woman. Willis won and they dated. One night a gang fight broke and out ad Luke had to rescue Willis, thus saving his life. As he recovered Reva tried to get him to leave his life of crime but he blamed Luke for poisoning her mind against him. Over time Luke and Reva got involved and even started talking marriage. Willis watched from the shadows and set Luke up with drugs for the cops to find and he was put in prison framed as a drug ‘pusher’. In prison and out of Willis way, he started dating Reva again. She got killed in the crossfires when he stole drugs from a rival cartel, Willis survived however. The doctor offers him a chance to participate in an experiment and thus he may be eligible for early parole. At first Luke declines until the demoted warden promises to make his time hell since he was the cause of all his problems. He then accepts the doctors offer to finally be free of prison. In the lab he undresses and enters a bath of chemicals and that’s when the demoted warden decides to push everything to the max to kill him. Trapped Luke is subject to terrible pain and finally lashes out destroying the steel container he was in. He dispatches his enemy and gets dressed, in anger he knocks his fists against the wall and the wall crumbles. Realizing he can now escape he batters the wall and flees he survives being shot and is presumed dead by the prison guards. For months he goes north until he arrives in New York and runs afoul of some drug dealers and manages to get paid for saving a man. 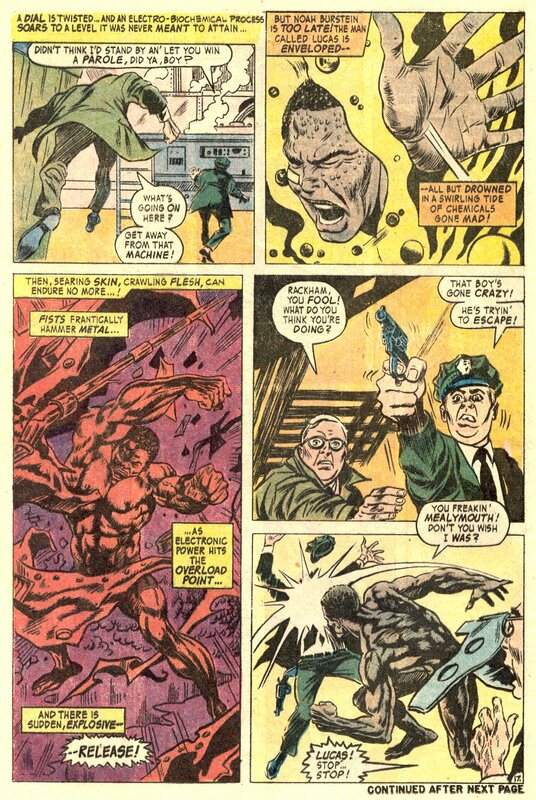 He visits Reva’s grave and renames himself Luke Cage and dons a superhero costume with plans to get revenge on Willis and make a living as Luke Cage Hero for Hire. Willis is now known as ‘diamond back’ is in charge of the area, he wants Luke cage found and his business ended since he has been causing problems for him. Where do I start? This issue showed Luke Cage for the first time and is historic and icon all at once. Luke’s origin easily holds up even today and that’s a testament to the solid foundations by Archie Goodwin. The story flows smoothly from his time in prison to his retelling of his past. Luke is also a character easy to empathize with, his best friend now an enemy, innocent man in prison and love lost. It’s not often that a first issue has the emotional resonance that this one does there is so much given to us in these 24 pages but every page is masterfully used and the end result is a first issue that is stronger than most. The origin of the man while interesting was given even more weight by the name he chose as a superhero. Luke Cage; Luke from his real name of Carl Lucas and Cage since he spent so much time in prison and that’s what he viewed is as a ‘Cage’. He even says that’s all he remembers of prison a ‘Cage’. This name illustrates the weight that prison and being there has had on him not only his origin but a very literal rebirth. Future enemies and villains also make their presence known though to a lesser extent. Shades and Comanche will be villains as this run continues and Willis is now a villain worth the beating Cage will give him as a lil kingpin in the New York slums. 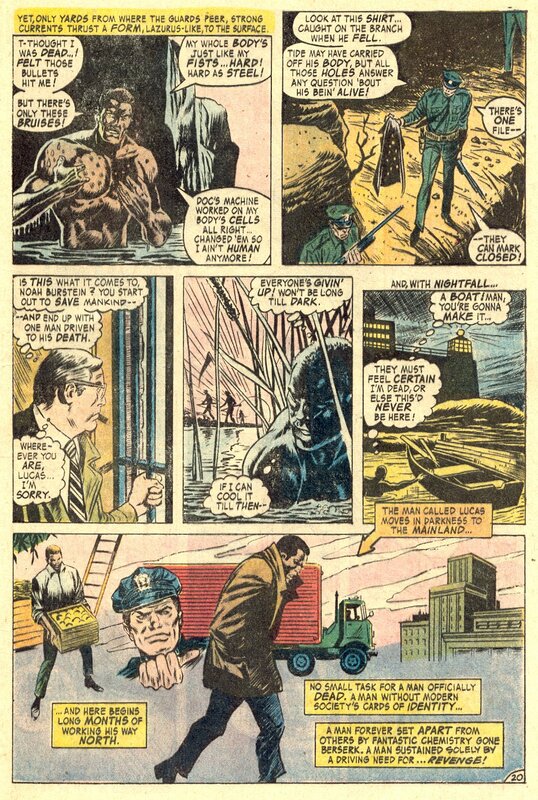 The art by George Tuska holds up well despite its age thanks to all around great pencil work and style. With no computer tricks to fall back on the story’s art hold its end of the bargain up by simply providing worthwhile visuals. 4/5 great origin, great art and a great start for one of the earliest blacks in comics. Todd and Stan want you to create the next Black Superhero!